My SBI Review: Site-Build It! This is my independent SBI review, written from the heart, to help you understand how easy it is to create your own online business (without the need to be a computer whiz). Site Build It! is the company that made this possible for me. In case you're wondering what or who SBI is, it stands for Site Build It!, recently renamed Solo Build It! It's the company that gave me the tools and the confidence (alongside plenty of step by step hand-holding) to build this website about Cocker Spaniels. I've been using SBI for over 10 years. I remember uploading my very first page and the joy I felt at seeing my work on the world wide web. Today, I still get the same thrill as I write pages or answer my visitors' questions. If you arrived here from my About Me page, you'll already know how I came to build this website, if not, you can find out here. You Don't Need to Be An IT Genius! I was nervous about the technical side of building a website as I had no real IT knowledge. I could use a computer for the basics and could surf the internet, but that was the extent of it! Who would have believed someone as non-techie as me could build a website? As it turned out, I didn't need to be a computer whiz kid or have experience of programming, web design or web building. This company gives you all the tools you need, not only to build a website but to build a successful business. And as if that wasn't enough, they help you through the entire process, step-by-step and at your own pace. They hold your hand all the way! How Does My Website Earn Money? My site began to earn an income at the end of the first year and it continues to grow steadily, year on year. How does it do that? As you browse through my pages, you may have seen some Google Ads, like this one here. Well, at the moment, this is where my income comes from. Each time someone clicks on a Google Ad, it earns me a small amount of money. There are many other ways to earn money with your website; for example, you could sell your own product or other people's products and receive a commission for each sale, or you could write an e-book and sell it on-line. There are many possibilities, but don't worry if you've no idea how to do any of this. SBI! will show you how to make the most money from your site. 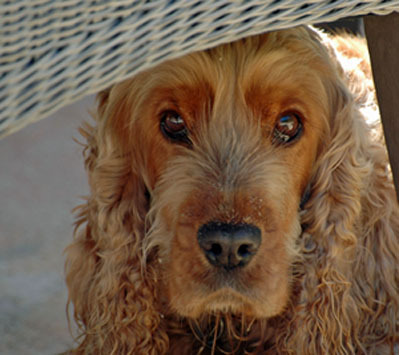 I've put a lot of time and effort into my website about Cocker Spaniels, and it's been hard work, but it's also been extremely rewarding and as I said earlier, after 10 years I'm still loving every minute of it! I don't want a bath! There are times when I wake up in the middle of the night with an idea, and I'm so excited about it that I want to get out of bed and start working! I've not felt like that in a long time. Since discovering SBI!, I can honestly say it's changed my life! I've regained the sense of purpose and direction that I lost when I retired. The ongoing development of my site gives me a satisfying sense of achievement and fulfillment, something which was sadly missing after I gave up work. It gives me the intellectual challenge I need to keep my mind sharp and has given me something to leap out of bed for in the mornings, well, almost leap! I sincerely wish I'd learned about SBI! much sooner! I often think of all those years wasted working for someone else, being unable to be there for my family as much as I would have liked. How I would have loved to be a 'stay at home' Mum! Although I didn't discover SBI until my retirement, (and I'm so grateful for that) I wish I'd found it long ago. Things could have been so very different. It's too late for me to turn back the clock, but it may not be too late for you. That's why I'm letting you into my 'secret'. to provide a solution to your dreams"
You may be a 'stay at home' Mum (or a working Mum who longs to be at home with her children) looking for an extra income. You may be about to retire, or you're already retired, and looking for something exciting to do, or you may need to top-up an ever-dwindling pension income. There are many successful SBI! websites built by ordinary people like you and me. Take a look at these case studies. They'll give you an insight into what other SBI! owners are doing and may give you a few ideas of your own. Cocker Spaniels are my passion, but it could just as easily have been cycling, fishing, photography, cooking or propagating roses. Your web business can be about any topic. You could simply write about something you know well, or have a passion for, such as a hobby or an interest. Imagine Earning A Living Writing About Something You Enjoy! Although earning a living doing something you enjoy may sound like basic common sense, how many of us do it? Most of us are in work because we need to earn money but very often we don't actually enjoy the work we do. SBI! could help you to work towards your dream. SBI! is completely risk free. They're so confident in their product that they offer a full 90-day money back guarantee! What have you got to lose? Their package comes with unlimited customer support, and the private forums are fantastic. There's always someone willing to help you, no matter what stage you're at. SBI! even gives you a comprehensive Action Guide (both in written and video formats) which will take you, step-by-step, through the entire process of building your website business. It's easy, all you have to do is follow the guide. Believe me, if this technically challenged individual can do it, you can too! Whatever your circumstances, I sincerely recommend you give SBI! a try and see what a world of difference it could make to your life. I promise you, you won't regret it. There's even a version of SBI! for Wordpress owners! Beware of Fake SBI Reviews! Unfortunately, if you search online for SBI or an SBI review, you're more than likely to come across fake reviews. I know they're fake because I've used SBI for over 10 years. I know and trust SBI. SBI gives you all you need (and the support) to build a successful business, not just a website. The forums offer an unmatched sense of community; generously helping those who need it. These fake SBI reviews have prompted me to write this page in the hope that it can help in some way to set the record straight. I'm writing this review of Site Build It! because I want to help fight back against fake SBI reviews by an unscrupulous company called Wealthy Affiliates. This company pays people to write untrue reviews about SBI, claiming that SBI is a scam and directs prospective customers to them (WA). When unsuspecting readers click on that link, the fake reviewer is paid an affiliate commision. Most of these 'reviewers' don't even own a website of their own. They are paid by WA simply for recommending them to anyone who reads their fake SBI review. The damage they are causing with these false reviews, written by people who have no experience or knowledge of Solo build it, is making me very angry. It is inexcusable and downright dangerous. They are potentially harming people's livelihoods by spreading these malicious reviews. I have used SBI for over 10 years and I know that these reviews are fake but please, don't just take my word for it. There are many other 'solopreneurs' who have built successful websites using Site Build It! Why not take a look and see for yourself? Ken Envoy (SBI's founder and owner) and his team carried out a professional, in-depth study into the claims that these fake SBI reviews were making. If you'd like to check it out for yourself, here's a link to the full study. It's rather lengthy, so if you'd rather cut to the chase and go directly to the results here they are. They clearly show that the claims WA is making are simply not true and the results clearly speak for themselves! Thanks for listening. I hope I've helped in some small way and I wish you all the very best for your future venture - wherever that may take you. Please Note: I'd like you to know that if you click on any of the SiteSell, Site Built It! or Solo Build It! links on this page, I will not earn a single penny. There are not affiliate links on this page. The purpose of my SBI review is to let you know that Site Build It! is a genuine quality product which actually works. All you need to invest, is your own hard work and determination to succeed. SBI! gives you all the tools you need to do the rest. I leave you to make your own decision. If you’d like to find out more about how I use Solo Build It! to build an additional income stream, please contact me.